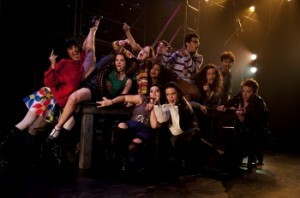 I know what you’re thinking: another review of another production of Rent. Well, read on, my cynical friends. Read on. For those of you that are just joining the world of musical theatre, Rent tells the story of a group of 20-somethings struggling to make it in New York while trying to overcome financial woes and the AIDS epidemic. As you might have guessed from the description, Rent is part feel-good romp, part emotional social commentary, all woven together with catchy rock-operatic numbers. So, off I went to the Lower Ossington Theatre with my dear friend Aaron in tow, prepared to see the classic take on Jonathan Larson’s show. And, in all honesty, that’s pretty much what we got, but in a compact, convenient package on the LOT stage. While I have to say that it took a few songs for the cast to find their groove and fall into a solid rhythm with the story, I very clearly remember Aaron leaning over during the song ‘Will I’ and whispering into my ear “Well, this just got interesting” – which is a compliment from Aaron. After that song, energy lifted, chemistry flowed, and the company had our attention. Here’s what I liked about it: Graham Fleming. I’ve seen a few productions of Rent in my day, but Fleming gave a respectable – and, at times, swoon-worthy – naturalistic performance of the brooding Roger, made even more impressive by his seemingly young age. While slightly unpolished, Fleming’s Roger is moving, largely due to his stunning voice. I have to give a shout out to Michael Galloro for his set. Made up almost entirely of scaffolding, Galloro’s set transforms LOT into a world suited perfectly to Larson’s story. The actors manipulate every aspect of it like a theatrical jungle gym; truly impressive for a fairly small space. Overall, the cast was quite spectacular. Their chemistry was great and you would be hard-pressed to find a weak singer in the bunch. However, I simply could not get on board with the choreography, which I found a bit juvenile and, perhaps, under rehearsed. Similarly, Aaron found the music and sound to be spotty at times. All things considered, I left entertained and moved. Talented cast, great set, totally worth seeing.